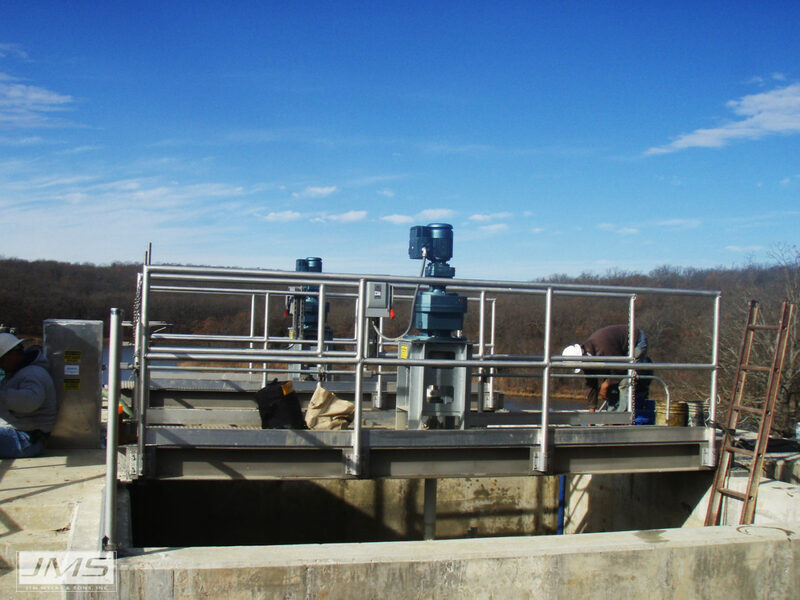 Mega-FLOC (Vertical Paddle Wheel Flocculator) offers a wide range of flexibility with easy installation, and the proven process performance of a paddle wheel design. 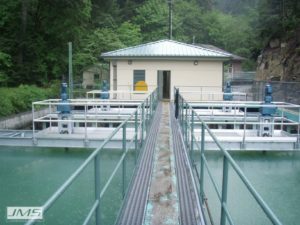 JMS Vertical Paddle Wheel Flocculators follow the “Ten States Standards” and are optimized to produce the highest quality floc particles. 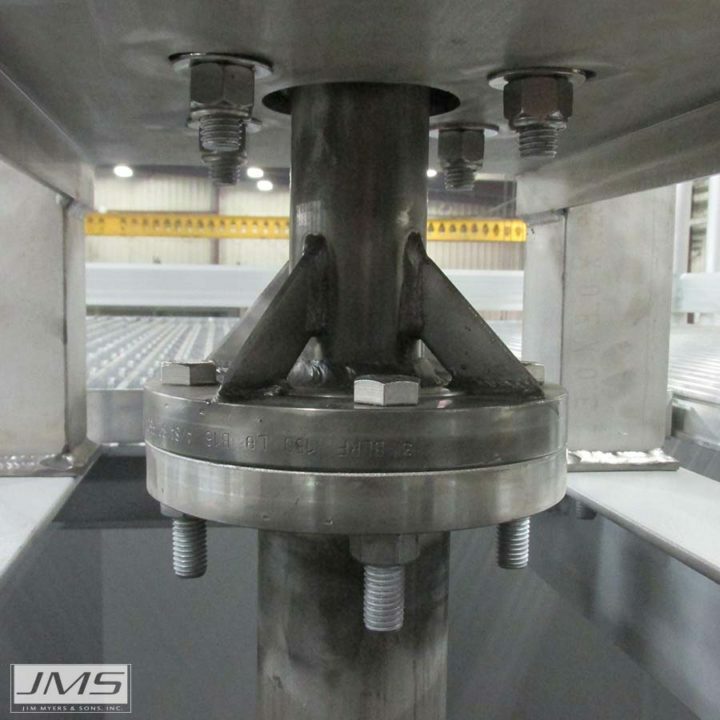 With hundreds of our Mega-FLOC (Vertical Paddle Wheel Flocculator) installations in operation, JMS has refined our design with unique and important features for maximum equipment reliability and longevity. The JMS Chain coupling is to designed to help transfer torque from the drive motor to the flocculator shaft. 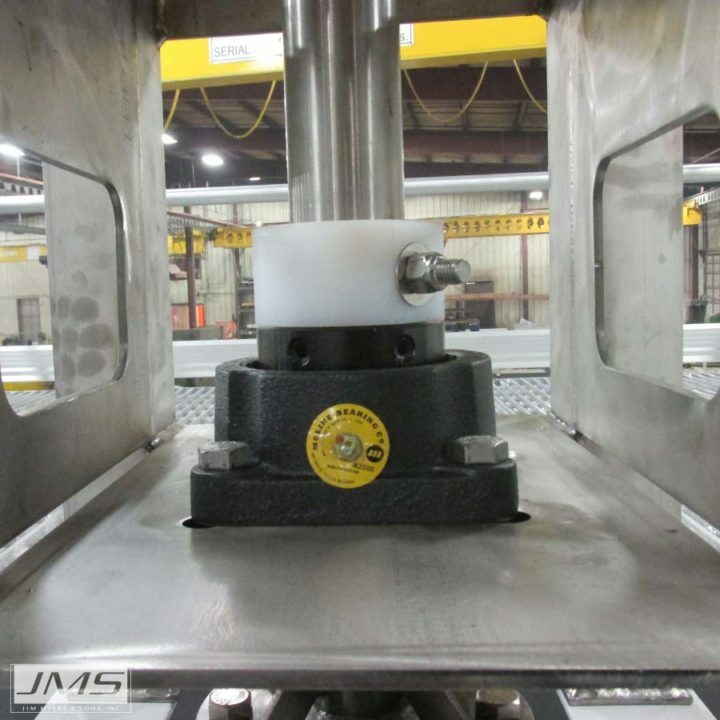 The JMS Radial Thrust Bearing is designed to absorb vertical and radial loads. 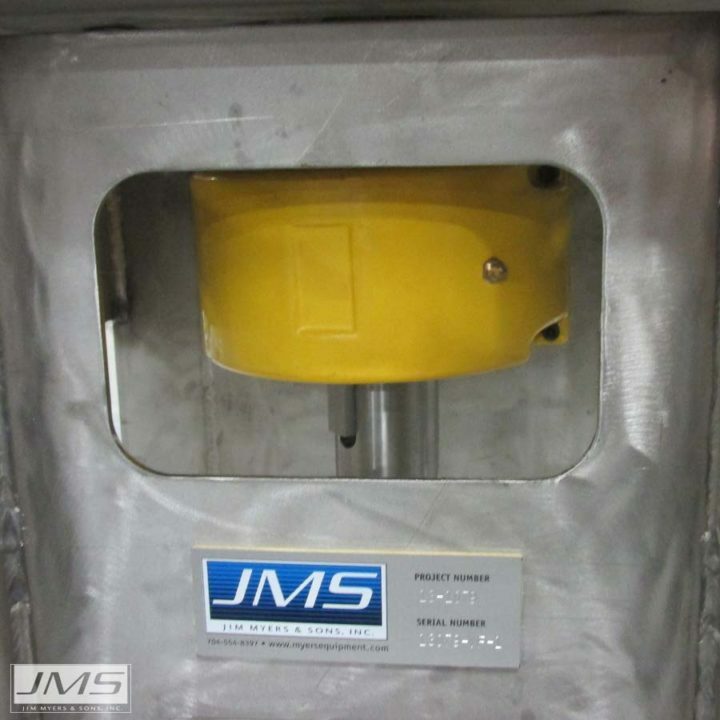 With this JMS only feature it reduces the stress of the vertical load on the drive motor. JMS shaft connections are the standard for all flocculators. 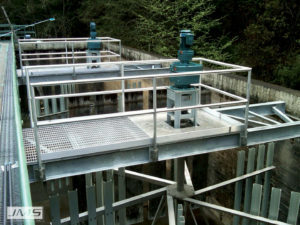 These connections utilize bored blind flanges with special welds for added strength. 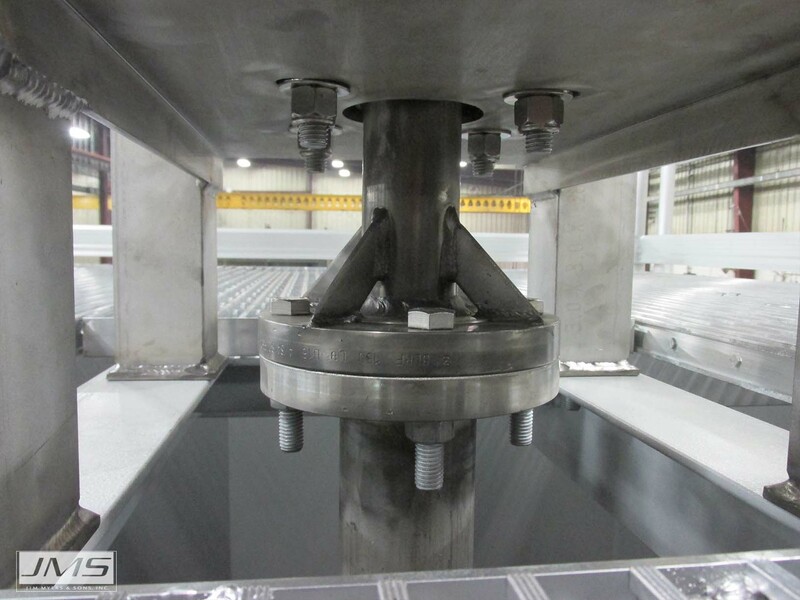 Each flange is grooved to the correct diameter and surface milled to parallel for strength and proper alignment. Engineered in a range of sizes to meet process demands, every Mega-FLOC (Vertical Paddle Wheel Flocculator) drive assembly (gear motor, drive stand weldment, chain coupling, thrust collar, radial thrust bearing, and drive shaft assembly) is designed and built to uncompromising standards. 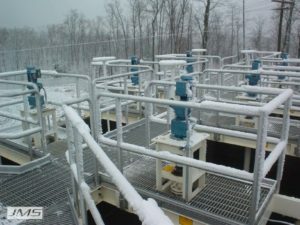 The result is powerful, reliable, uninterrupted performance. 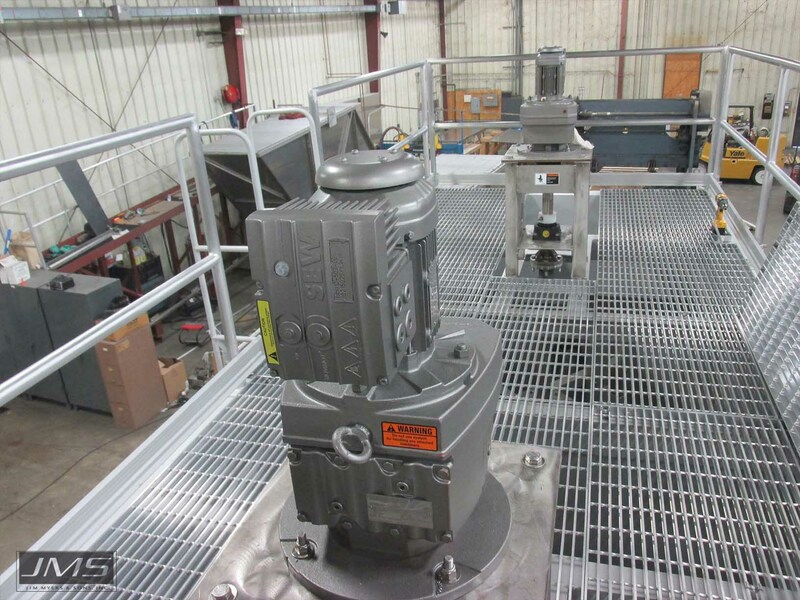 To protect the gear reducer and ensure the longest possible component life, a radial thrust bearing takes the brunt of all loads (vertical, axial, radial, etc.). 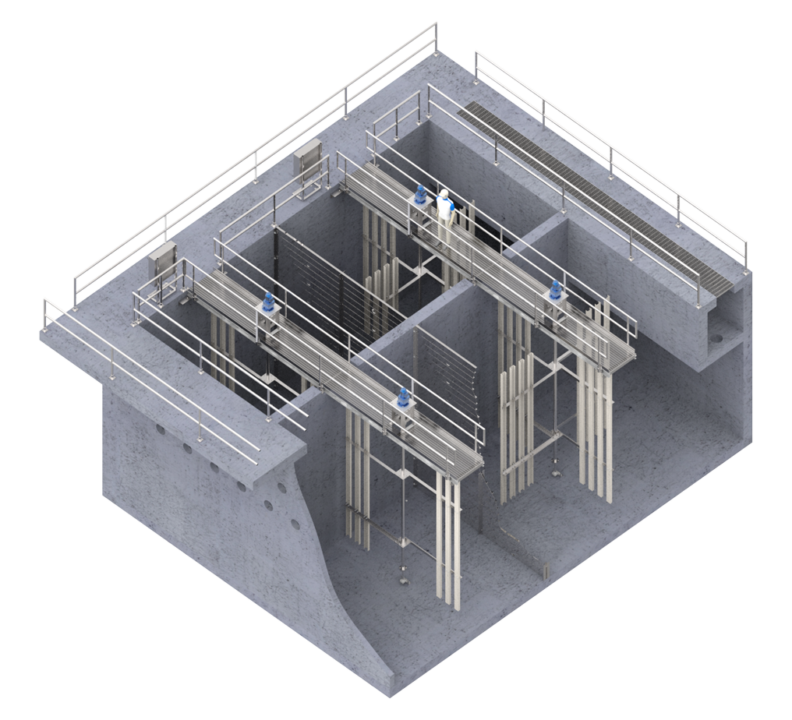 This commonsense design and accessibility makes operational and maintenance procedures a breeze. 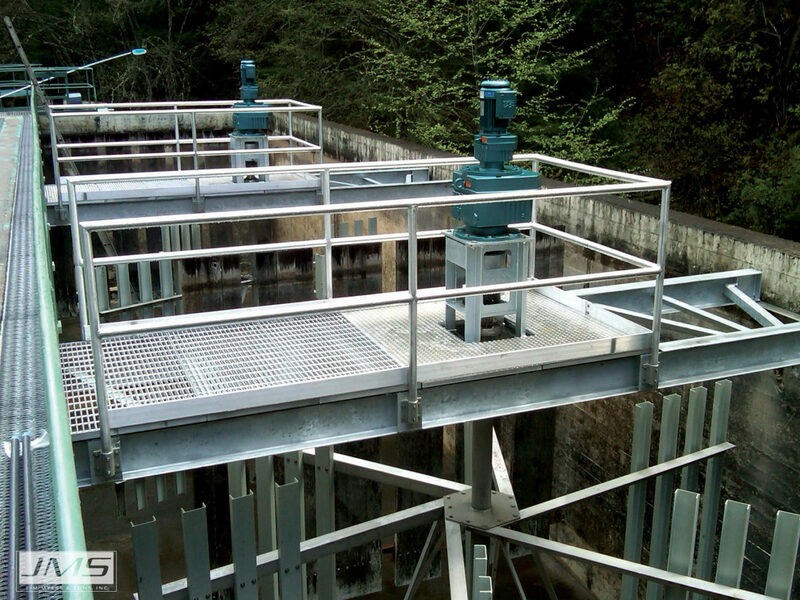 To minimize the need for fabrication subcontractors, every JMS Mega-FLOC (Vertical Paddle Wheel Flocculator) is designed, manufactured, assembled and tested as a complete bridge-mounted unit. The Vertical Paddle Wheel Flocculator/bridge assembly, identical in design to hundreds already in place at locations throughout the U.S., ships fully assembled and ready for installation. 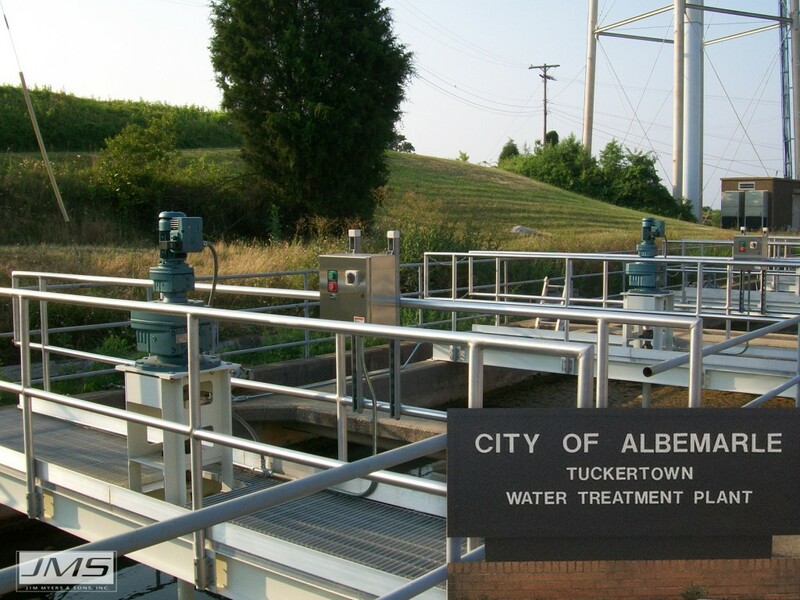 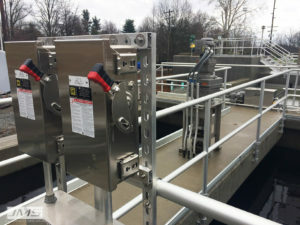 Located about 50 miles east of Charlotte, N.C., the City of Albemarle’s Public Utilities Department operates a wastewater treatment plant and two water treatment facilities. 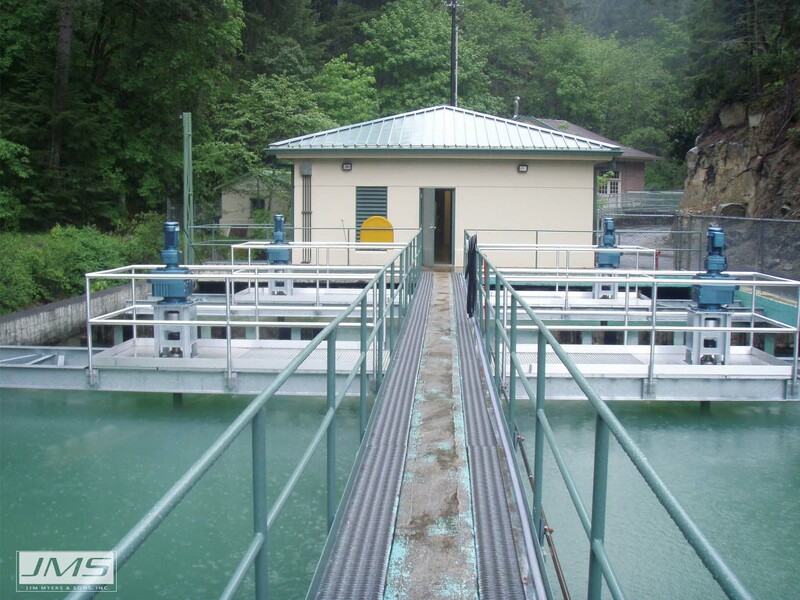 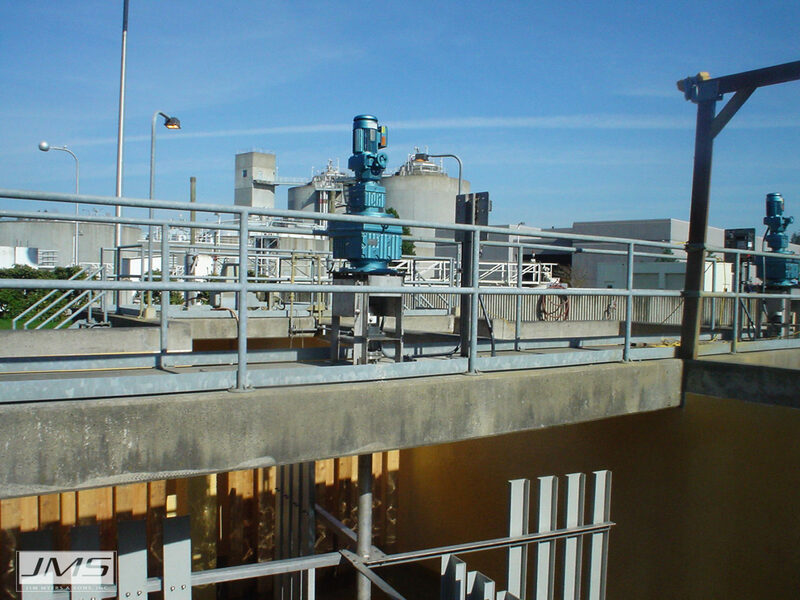 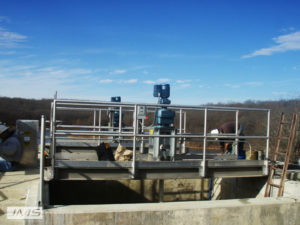 One of the latter, the 12 million gallons per day Highway 52 Water Treatment Plant was experiencing wear and maintenance issues from its outdated Vertical Paddle Wheel Flocculator and treatment system. JMS was contacted and asked to offer its expertise in replacing those units and getting the process back on track. 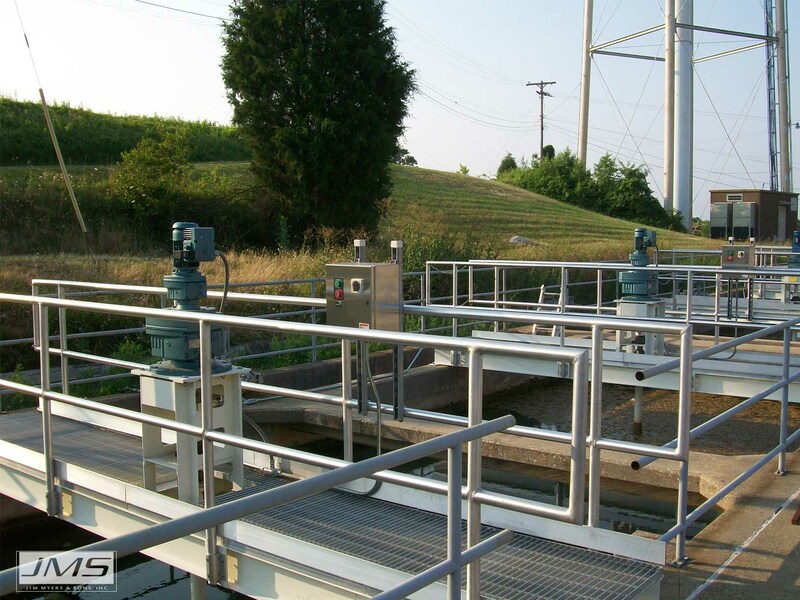 Working with key utility and engineering personnel, JMS was able to replace a few Vertical Paddle Wheel Flocculators per year, improving the overall process while, at the same time, keeping the utility within their annual maintenance budget. Today, the entire system has been converted to Vertical Paddle Wheel Flocculators from Jim Myers & Sons, and the plant is reporting better performance, lower maintenance demands, and a much higher degree of reliability. 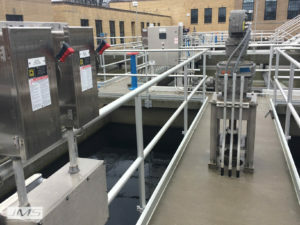 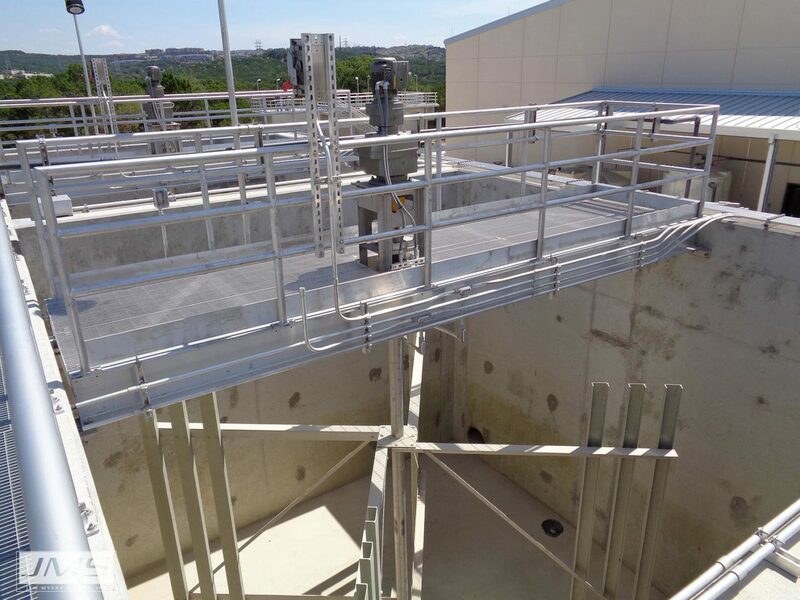 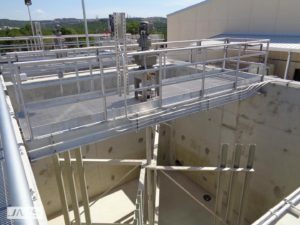 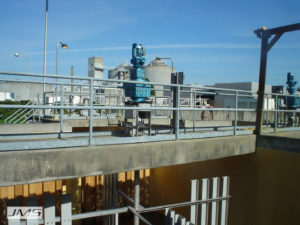 Their level of satisfaction was so solid that plans are in the works to replace their old sludge removal system with a JMS Mega-VAC Hoseless Sludge Removal System in the near future.